creative savv: One of the things we've missed . . .
One of the things we've missed . . .
We're not terribly picky about which kind of juice. I love orange, pineapple and tomato, myself. One of my daughters, in particular, loves tomato juice. Well, remember all of those canned whole tomatoes that I've been oven roasting? There's all of that liquid from the cans leftover. My tomato juice-loving daughter has been enjoying this "juice", as juice. And she's right! It is delicious. A pinch of onion powder and a bit of salt, and it's unbelievably good! If I had some celery salt in the house, I imagine a bit of that plus onion powder would be very tasty. 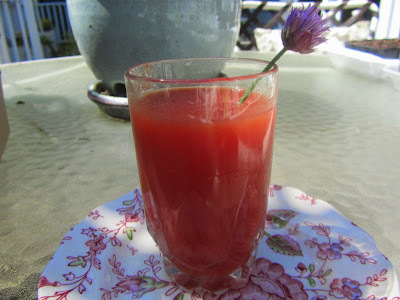 While this tomato juice is not exactly free, it is a by-product of making oven-roasted tomatoes. And even at the price of the large can of whole tomatoes, our juice is still a bargain compared to the 46 ounce cans of canned tomato juice selling for around $2.50 or so per can at the supermarket. I can imagine the juices from roasted canned whole tomatoes must have been rich and tasty, and far better than canned juice. Since reading your blog, I've been extra careful not to waste what usually I have tossed out all these years. I would have never thought of saving the juices from roasting tomatoes. I don't particularly like tomato juice (from being forced to drink that every day), but I could keep that for stews and soups, or in some tomato stir fry like beef tomato..
oh yum! A beefy-tomato stir fry would be delicious, and would use up leftover tomato juices! I'm not a lover of juice. But I also did save the juice from tomatoes and drank that but it was rather strong. I bought some grape juice not long ago and just couldn't drink all of it. I have a full container of OJ in the refrigerator due to having some sick kids but nobody is drinking it. I think I should freeze it for a future time. I suppose it's good that we don't love juice because some can be very bad for you. If I were in your area, I could take that OJ off your hands for you!! Yes, I'd freeze it, perhaps in 1-cup portions, for the next virus to pass through your family, if you all don't care much for juices. OJ is also good, IMO, mixed with black tea and spices for an iced spice tea. I once had so much frozen OJ to use up in a short time (was moving) that I had to come up with ways to use it all. I made an orange chiffon pie that turned out okay, and used a lot in sweet/sour stir fries (I made an orange-chicken dish that was pretty good). You may be able to use it that way, too. That's an interesting idea. I'm more of a V-8 gal, myself (actually use it for some recipes as well as drinking); but I try to use the liquid from tomato products as "free" liquid in recipes, rather than draining it all away. I'll have to give it a taste-test, at least! Oh, and I wanted to mention, re: the roasted canned tomatoes I made-- I just brought out another can and noticed that the best-by date is two years ago! So the delicious ones I made the other day were the same age. I'll be able to use them up easily and enjoy them, now, with your recipe! Hooray! I "discovered" V8 as a teen, and I've loved it since. In addition to drinking the leftover juice from the canned tomatoes, I'm now experimenting with making a V3 juice, using what I have here in the kitchen, and tomato paste. It's been pretty successful thus far. I'm using tomato paste, water, celery seed, onion powder, salt, sugar, and a bit of lemon. I'm enjoying it. Arbols, I'll look those up. Arbols look a lot like cayenne peppers, but they're a little bigger and browner. They are a bit less hot, too. I just looked on the Scoville scale, and the two "arbol" peppers I found were both 30,000. That's a little hotter than a Serrano, and a little milder than a "long thin Cayenne", which I think refers to the one I've grown and that you get in most Chinese restaurants. It took a LONG time to dehydrate the arbols (longer than I recall with cayennes), so we finally slit them all and that speeded things up a lot. Thank you for the information. At our local produce stand, I sometimes have the opportunity to buy a mixed bag of peppers, not knowing what any of them are. We don't do super hot peppers here, either, but opting for flavor over heat. We do buy juice occasionally, but usually cut it half/half with water. I've grown to like it better that way.Tomato juice is okay to drink, but I have discovered that I really like it as a base for vegetable soup--better than just adding tomatoes. I've always been accustomed to oj that is diluted with a little extra water. The full-strength tastes too strong to me. I imagine tomato juice would be delicious as the liquid in vegetable soup -- very favorful!